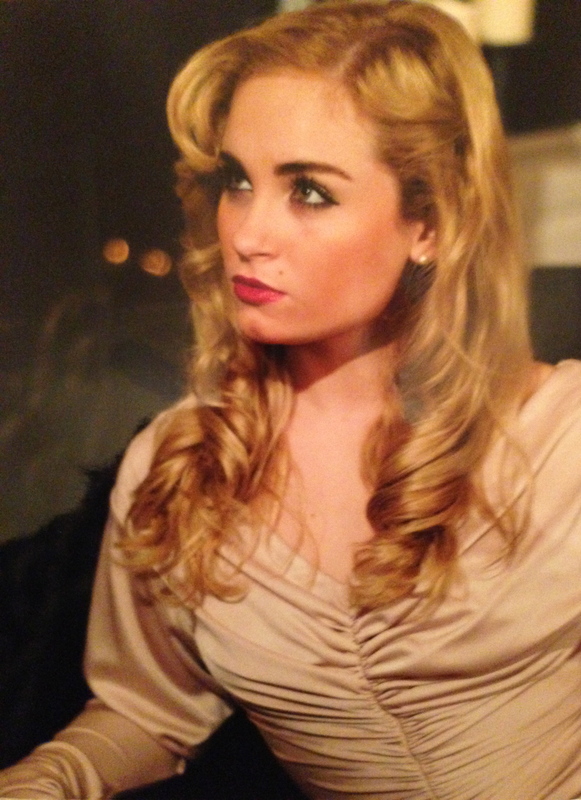 Liza, senior portrait ala Hollywood glam per her acting career choice. Her heart for her Savior is exquisite. Liza’s 1st day of 5th grade-same age she gave her heart to Christ. 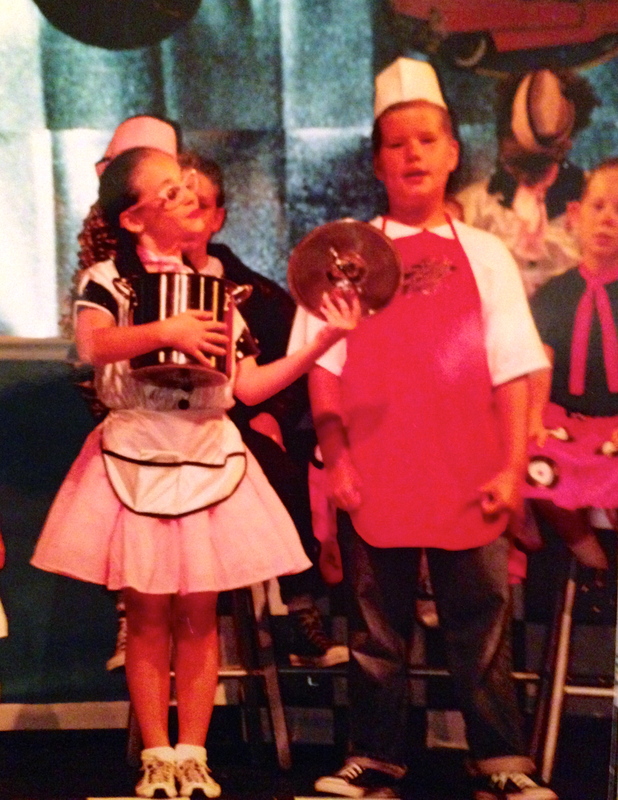 Liza in a church youth play; she’s holding the pot lid that has the boy’s lines tape onto them for a little assistance. Read today’s blog and it seems that God was answering all of our long-awaited prayers. And according to these journal entries, He was..a job after a year of searching, moving back to Texas from Canada into a month-to-month apartment and now preparing us to move into our dream home & a good school. But none of this came true. Not that job, that house or that school. God had a much better plan. His plan, always at work, included so much more than the paychecks and mortar (of course, I shouldn’t worry about such things and should do as the flowers and birds and know that God will provide water, food and shelter). We were by no means hungry, in danger or roofless. But, come on! A year! We had been job hunting, living in a temporary state of the unknown, clinging to God’s every word for so long. We called our Frisco apartment ‘John’s cell’ where we were dependent on God in a hovel. And we kept telling our kids ‘God is gonna, God is gonna’. Ok, so go already! And then the apparent end is in sight! All questions answered in a neat package. The next blog post will show that wasn’t true. Now, way on the other side of ‘the journey,’ God’s plan was perfection, as always. So rich. Full of gems that couldn’t be unearthed without the wasteland. 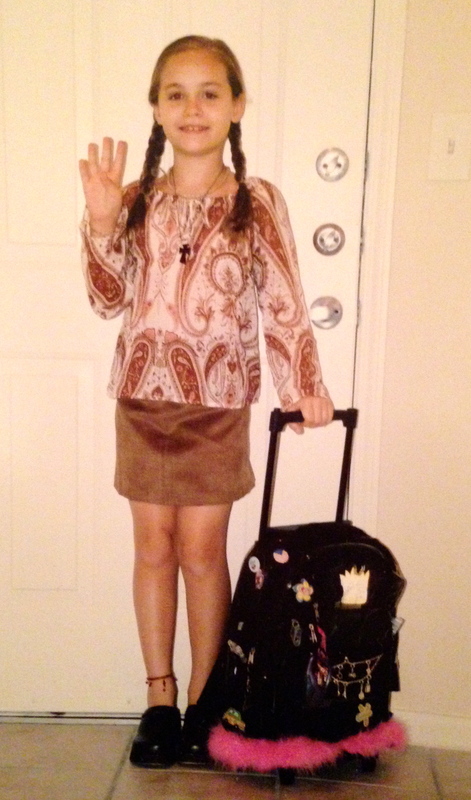 Like my Liza’s Jesus moment in 5th grade (see below). She gave her heart to Jesus while she lay in the bedroom she shared with Lena and their matching butter yellow matellasse coverlets. That isn’t the only time she committed. Lena and Liza describe how they went forward (or actually down the multiple flights of stairs and onto the arena floor) at a Billy Graham event at Texas Stadium as grade schoolers and publicly accepted Jesus. Don’t we honestly accept Him over and over? Like a child, we say ‘yes’ every time. Liza’s heart for Jesus now is exquisite. She has believed since she was little and then her fire blazed strong the summer before college. So much like Greg, she is a quick study & has taken every nuance God has taught her, internalized it and put it to quick action. She is what I call ‘a kamikaze prayer warrior.’ She’ll pray with anyone she sees needs prayer, diving in, ready to give of herself completely for the Cause. Oh Lord, cover her as she does Your bidding. All that Greg and I could say yesterday was “You are awesome!” We saw the house on St. James again Monday & Tuesday and it feels right. The realtor showed us homes that were bigger, more nooks & crannies, more trees, but this house is the one You planned for us. Our miracle home. It has a future. We can create our own style with this land & home. We feel that settling anywhere else would be going against what You have made clear is what’s right for us. We want to honor You & do what is asked of us & offered to us. Where’s the highest mountain that I may shout “Hallelujah!” and spread Your message?! Oh, that I might bring someone to Christ. Please. Lord, tell me what to pray for. We wait again. Everything is lined up–the house, mortgage, schools; we just need the contract on the job. So we continue to be very thankful for all that You have done & will do. We will pray over & over for Your will to be done. We remain steadfast in You. I am finite, You are infinite. I am weak and need Your energy to keep going & praying. I am submissive to Your will. Lord Jesus, I pray for Your guiding hand over the choreography of the musical today. I always look so forward to creating for You; spending a Holy Spirit-filled time with You. The high that I get from You working through me is outstanding & incredible. This time I need to give more public thanks to You for Your gifts. I pray for Your presence today. I pray for focus. I pray for organization. I pray for creativity! Through You I can do anything! I pray to be an active listener & not a passive listener of You. Dear Lord, I have so much to be thankful for this day What a wonderful weekend full of laughter and celebrations. First & foremost, a ‘Yea God’ for answered prayer #1: as quoted from Liza about me, “You were a messenger.” Yesterday You taught Liza a valuable lesson to ‘let go & let God’ and You let me be the messenger of the good news! Then, Lord Jesus, Lena asked to talk because she feels left out. Liza just had a ‘yea God’, Cody got baptized & Greg & I are walking with You. Lord, she’s on the edge ready to commit to You. She said she knows fear is in her way from accepting You in her heart. Oh, Lord, work on her heart. Push the devil far away. Help her to this defining moment that she will give all of herself to You. Just now, you reminded me of something You have taught me about Lena through those past 11 years; Lena always gives an initial indication that ‘the big step’ is going to happen at any moment & then it doesn’t happen until moths later (such as taking her first step, potty training, reading, learning multiplication, commitment to dance). You are telling me to be patient…again. Okay. I trust You & pray that You take all fear away, far, far away. And thank You for giving Greg & I the words to talk with Lena about accepting You. Lord, Greg & I both prayed that we could help bring someone to You , but we didn’t know it would be our own daughter. Thank You. On my knees, thank You. 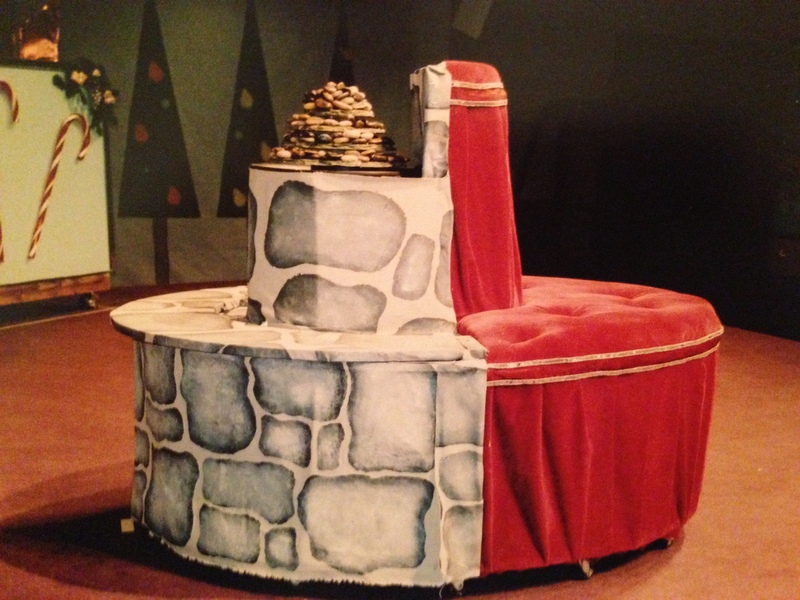 THE CHRISTMAS POST, 2002 set Greg built & I partially designed. There’s a revolving door to Herzog’s Department store & the 2-sided pieces rotate for other scenes. 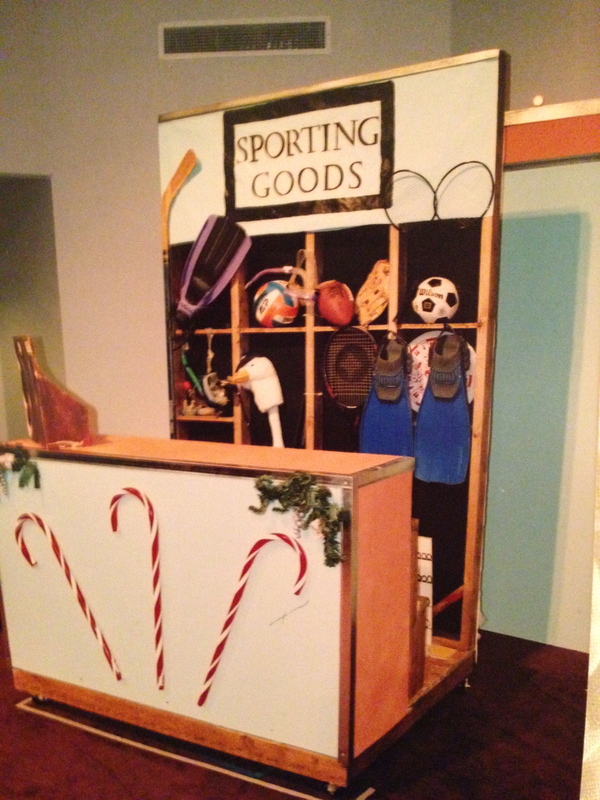 This half is the Sporting Goods Dept. ; the other side is a Christmas tree (see in the full set pic). 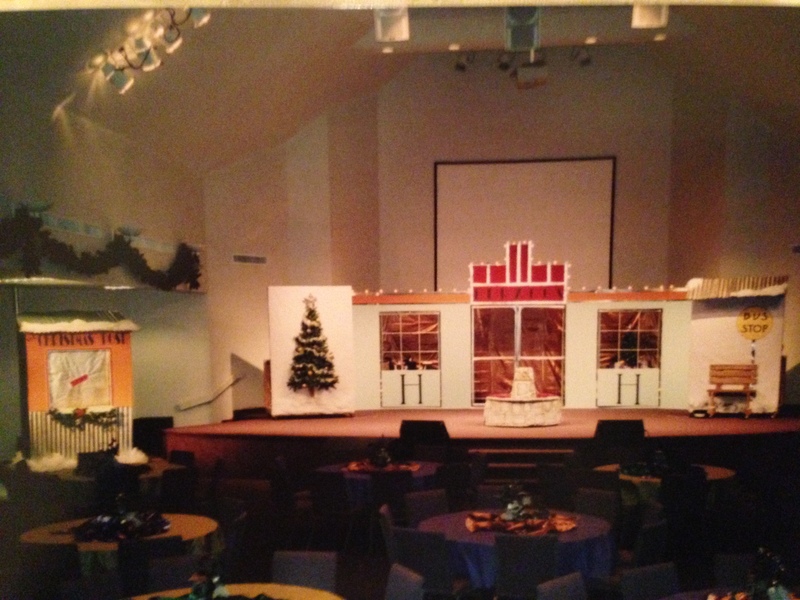 So much love & time given to all the sets Greg & I did together for our church at the private school. We would do it all over again. Finally, thank You for all that You gave me for the musical. We are cooking! 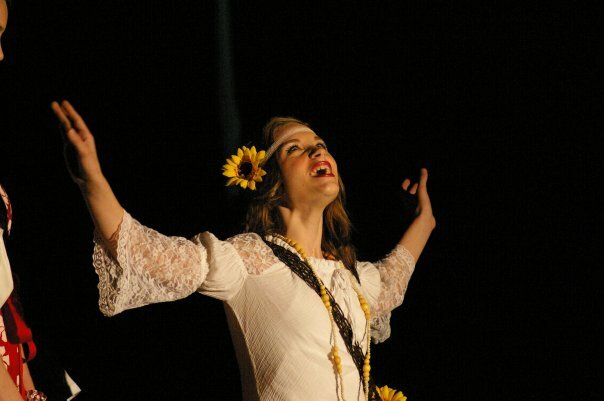 You were all over the weekend, & prior, to put together some awesome stuff for the play. And we had a blast learning, as usual. Laugh, laugh, laugh! You are awesome! Amen. The rest of the scripture talks of people from around the world going to Jerusalem to attend theses celebrations. I feel You are telling me to replace ‘your house’ with ‘Jerusalem.’ That we will be immensely blessed and will bless others. Thank You, thank You. Praise You, oh heavenly Father! You woke me up at 5:30am “Get up! There is so much to be thankful for! Let’s go!